Due to lack of accomodation and increase in number of visitors to Shree Samsthanam, the Jnana Mandir was built. The Auditorium has been built artistically with enough room for light and air. It can accomodate a 1000 – strong audience at a time. Like in Gurudev Sabha Mantap, there is a beautiful statue of Shree Guru Dattatreya in the stage. In this very Auditorium Jnana Mandir, very many historical events were held. Mention may be made here of Karnataka Classical singers conclave, week-long Yakshagana Saptaha and Tulu Literary Meet. The inauguration of Grama Vikasa Yjane (Rural Development Plan) on the occasion of Swamiji’s birthday was also an historical event held in this Jnana Mandir. As we alight the steps of Jnanamandir, we see the Kalinga Mardana Krishna idol to our right side. As we move further, we see the sculptural marvel of Sheshashayee Srimannarayana. Then as we walk towards Shree Gurudeva Ashram, we come across the attractive carvings of Shree Guru Dattatreya and Prana Devaru. Dharma is the very life breath of human beings in society. An orderly social life gets nourishment from art and culture. Knowing the truth that an able and efficient society will be reality only through proper education, Swamiji provided for nourishing culture. Vyasa Sahitya and Dasa Sahitya (Literature by Vyasa and Dasas) are like the two eyes of our culture. Hence, Haridasa Sammelan was held at Shree Samsthanam. Keertanakaras from the region and outside took part in the event. The cause of literature too was served on the occasion, in grand manner. Similarly Samsthanam has the credit of organising Karnataka Classical Musicologists and singers. Swamiji has provided for the study of music and singing, as an act of worship. Art is not merely confined to entertainment. Art must lead to expansion of intellect and light of awareness. It is Swamiji’s conviction that honouring art and artistes is the first step of preserving culture. Hence, Yakshagana Talamaddale Sapthaha was held. 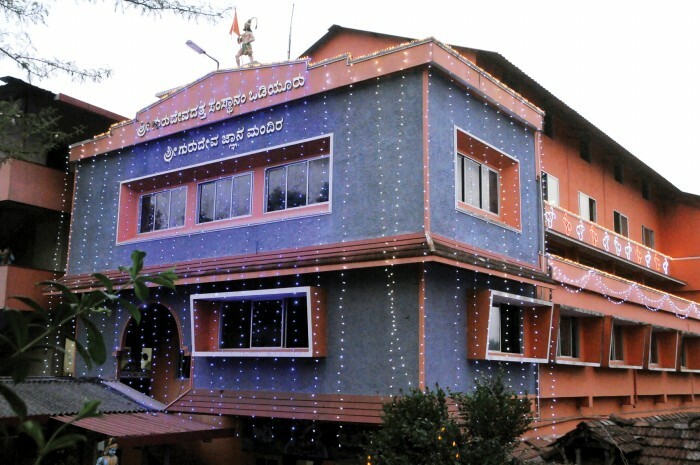 At the end of the Sapthaha held over a period of seven weeks, artistes who rendered seminal service to field of Yakshagana were felicitated Shree Samsthan initially provided facilities for the study of Vedic Mantras and music and Swamiji then resolved to build an ideal educational institution and the result was that Shree Gurudeva Kannada Madhyama Proudha Shale (High School) was declared open on 11-6-2001. The institution has developed since then. Thanks to teaching of cultural awareness, discipline and restraint and a dedicated band of teachers inspired by a spirit of sacrifice. Shree Samsthanam provides text books, uniform and mid-day meals to the students and bears all the expenses in the absence of any Governmental grants. The curriculam also includes introduction to Sanskrit language and moral education. Attempts are on to start Yoga training. Most of the families around Odiyoor, a rural area, are economically not self dependent. As national development is possible only through rural development, Shree Samsthan took up village expansion programme (Grama Vikas). Priority is given to provide health, sanitation, water supply and road communication under the plan which aims to help integrated village development in stages.